"I don't have a gambling problem. I have a financial problem." Philip Seymour Hoffman's gallery of cinematic losers is like some bizarre extended essay on everything a movie star isn't supposed to be: needy, desperate, flailing, unsuccessful, pudgy, and short. But the man has got some skills, and he inhabits the souls of these guys�Todd Solondz (Happiness) and Paul Thomas Anderson (Boogie Nights) are especially attuned to Hoffman's unique skill set; his talents are very much on display in Owning Mahowny, but the movie he inhabits is actually kind of a droopy one. Hoffman plays Dan Mahowny, just promoted at his Toronto bank to assistant manager. His girlfriend Belinda (Minnie Driver) is a teller there, and Dan looks like an up and comer—his suits fit him poorly, he's not the most scintillating guy, but he does know how to massage the system on behalf of his clients and his employer. Trouble is, Dan also has a nasty gambling habit, and he's a very bad gambler. His bookie (Maury Chaykin) shows up at the office to collect on Dan's latest round of bad bets, and is threatening to cut him off—that simply will not do, so Dan springs into action. As it happens, he's uniquely well positioned to wreak havoc at the bank and at the craps table. Dan uses the authority of his new position to authorize loans, to extend lines of credit, to get great heaping piles of bearer bonds, which he then cashes in and loses in a hurry on his weekend trips to Atlantic City. Mahowny doesn't like wine, or women, or fine food or the floor shows—he just wants to gamble. A lot. Of course Mahowny's Ponzi scheme spirals further and further downward—more shaky loans, more losses; still more shaky loans to cover those losses, and so forth. It's a pretty by-the-numbers portrait of a man drowning, and it's not anything that we haven't seen before, but Hoffman is good enough to keep us watching—Mahowny is just so sad as the house wins again and again, and nearly joyless on his occasional runs of good fortune. He knows they won't last; they never do. The work of the rest of the cast is perfunctory, largely because they're not given much to do. Driver wears a blond fright wig and has no clue about the depth of Dan's problems—he's just lost $1.4 million in A.C., and she wants to help out by cashing out her $2,000 pension fund. Chaykin wears a hilarious hairpiece, and he's a good warm presence, but his part basically boils down to saying over and again: Where's my money? With even less to do is John Hurt, as the finicky Atlantic City casino manager; he's been terrific elsewhere, but here you may long for more for him to do. As it is, basically he and Hoffman just smile and grimace at one another across the blackjack table. It's nice for once to see Toronto as Toronto, instead of doubling for a city south of the border; that and Hoffman's performance are the best things here. 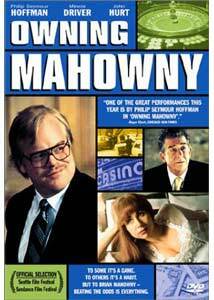 But Mahowny's inevitable trip downward is a predictable one, and given that Mahowny keeps his own counsel and that no one else gets much to do, it's not the searing portrait of a man committed to his own undoing that you'll find in a movie like, say, Leaving Las Vegas. Image Transfer Review: Occasional b        lotches and scratches can be detected in the transfer. Also, the filmmakers use a couple of rack focuses, which look especially ugly on the smaller screen, and serve inadvertently to point up the frequent lack of clarity in the image quality. Audio Transfer Review: Dynamics can be a little dodgy here�the actors can be a little mumbly and it can be hard to make them out at times; at others (toward the end especially), the musical scoring is just way, way too loud. Little other aural interference, though. Extras Review: Only chapter stops and trailers. Philip Seymour Hoffman elevates what's otherwise a rather perfunctory gambling addiction story. It's made with some slickness, but you've probably seen most of this stuff before.